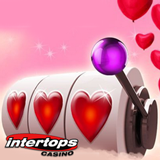 Intertops Casino is spreading some love this Valentines -- in the form of massive weekly casino bonuses!. Every week 300 players will receive $30,000 in casino bonuses. “The more you play, the more points you’ll earn, and the bigger your prize could be each week!” reminds Intertops Casino’s manager. Intertops Casino offers hundreds of games including the latest from Realtime Gaming: Double Ya Luck and Wild Wizards. Double Ya Luck is a slot with a board game bonus feature. Wild Wizards is an enchanting sorcery-themed game with five magical bonus features.